The Sharks are on 32 points, the Rebels on 35. Victory for the Rebels over the Highlanders in Dunedin will see Dave Wessels’ side qualify for the playoffs. The Sharks need to beat the Jaguares at home and hope that the Rebels lose to the Highlanders. The Brumbies had a slim chance to qualify, but their narrow defeat to the Chiefs (they would’ve perhaps felt hard done by a refereeing howler at the end which saw them suffer a narrow defeat despite having momentum on their side) has effectively ended their chance of playoff rugby. They can still make it mathematically- thrash the Waratahs with a bonus point, hope Rebels and Sharks lose and Rebels don’t pick up a bonus, and make up the 23 point swing that currently exists between them and the Rebels. 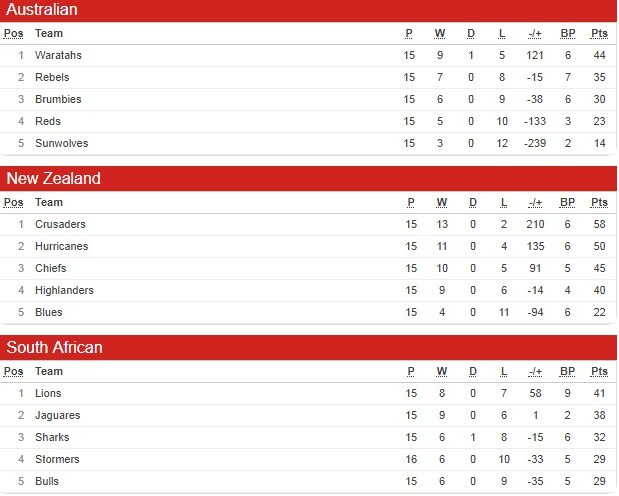 Next Next post: Super Rugby Quarterfinals 2018- Which teams have qualified for playoffs?